Open Data Campaigning Camp last week brought together around 30 campaigners, developers and open data experts interesting in exploring the intersection of open data and campaigning. Campaigners work to influence change, often by building up and demonstrating popular support for an issue: working to attract attention to issues through mainstream media, online media, and face-to-face engagement; working to educate supporters; and working to encourage them to take actions that demonstrate their support for an issue, or that directly lead to change (e.g. climate campaigners calling for us to reduce our energy use; or Fairtrade campaigners encouraging changes in buying habits) . As Chris Rose explained at the E-Campaigning Forum (ECF) that directly preceded Open Data Campaigning Camp, campaign strategy often involves engaging with a variety of different groups (segmenting the audience), and taking potential supporters on a journey through a number of stages of awareness, interest and engagement with a campaign. Open data in this context refers to the increasing availability online of datasets from governments, agencies, NGOs, companies, crowd-sourcing initiatives and other groups that can be used to discover, remix and present information. Open data can cover a very wide range of subject areas, and come in many forms, from geographical data, to data on provision and performance of services, to data from news reports about political decisions, and real-time data on weather or train times. Different datasets have different properties that affect how they might be used. However, to be fully open, data should be machine readable in freely available or widely accessible tools. Most organisations can explore ways to make a difference with open data both as consumers of open data from others, and as suppliers of open data. Developers have programming and/or design skills for working with data and are able to use code to manipulate and present data in many different ways. Whilst a number of consumer tools exist for working with data, the diversity of ways data can be structured and worked with means that developers often play a role in sourcing and preparing data for use, or in creating advanced interfaces and services on top of open datasets. Our cast at open data campaigning camp also included managers and entrepreneurs exploring how open data may be relevant to them. We didn’t have many researchers, statisticians or policy people – something we realize may have been useful to better understand the role of open data in the whole of the campaigning process – as frequently campaigns are based upon issues identified through research and policy teams. We started the day with a number of presentations. I offered an overview of open data, looking at the history of the open data movement – as it brings together Right to Information/Freedom of Information (FOI) campaigners, open Public Sector Information (PSI) lobbyists, and advocates of open technology driven government modernisation – and at progress towards open data in the UK and other countries in recent years. The current open data environment today is itself the product of many campaigns from a range of different groups, and, as Javier of Open Rights Group highlighted, the campaign goes on with conversations around proposals for the Public Data Corporation. 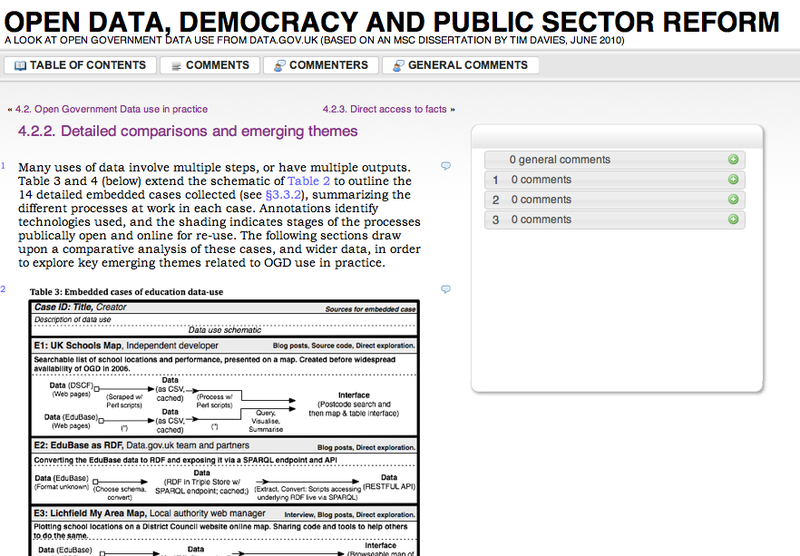 I also touched upon the different routes by which open data can drive change (at least in public sector reform contexts: there will be others in broader campaigning terms), and the different political theories of change linked with each. After a look at the wide range of types of data potentially available for re-use, we turned to presentations on specific open data projects. Simon Parish from AidInfo presented on the International Aid Transparency Initiative which has been working to gather standardised information on aid spending from donor countries and agencies. Data from the UK Department for International Development (DFID) has recently been added to the IATI Registry and more data is coming from other countries. With the data now available, exploring ways to make it accessible and use transparency to drive change, and a renewed focus on building the evidence base for the impact of transparency becomes important. David Kane from NCVO, in a talk sub-titled ‘Why my inbox is a stream of misery’ presented on the Voluntary Sector Cuts website – built using a combination of the free Google Forms platform, and the open source Exhibit tool for mapping, displaying and filtering the contributed data. Over 400 cuts in voluntary sector funding have been reported through the website (each triggering an e-mail to David). Whilst the ‘data’ on value of cuts reported, and tagged information on the sectors being cut, provides a useful insight into funding cuts, David highlighted how primarily the site is collecting stories. The ‘data’ filled into report forms acts as meta-data to help explore the stories of how spending cuts are impacting charities. Reports to the site are not verified, although there have been some sensitivities with organizations asking for information to be temporarily removed whilst they are involved in negotiation with funders. Joel Bassac from Oxfam International shared a specific challenge with participants around an upcoming food price campaign – explaining work going on to build an interactive map of where high food prices were impacting on people’s lives, and asking how else open data could support food price campaigning. Rolf Kleef and Pele Aardema of Open for Change convened a group to explore creating a revision of the Open Knowledge Foundation’s open data manual specifically geared towards development agencies looking to share open data. There was a particular focus on identifying ways to make the case for open data to managers within an organisation, and a draft map was developed to show all the different places within an organisation where open data could be found – not just in aid transparency data. Project information, contact lists, library catalogues and many other datasets can also be useful to open up to aid collaboration between development organisations. ECF convenor Duane Raymond has collected over 10 years of online campaigning e-mails from a wide range of organisations – with fantastic potential for analysing changing patterns of online campaigning. Tim Green began exploring possible analysis by taking the free-text from e-mails and passing it through the Open Calais service which extracts key terms from free text, and allows patterns in the content to be identified. With more work this analysis could yeild interesting conclusions about how e-mail campaigning has developed, useful to feed back into future campaigns. The potential for real-time analysis of incoming campaign e-mails was also explored. There must be many personally held research datasets in organisations large and small: finding ways to help those holding such data to share it openly and to benefit from the analysis and insights could turn out to be a very useful way to strengthen the open data eco-system. Responding to Joel’s challenge, one group focussed on building a campaign out of food price data. You can find a full write up of this particular project along with some of the visualizations we created over on the Open Data Cook Book. So did we succeed in working on what the ? is that campaigners can combine with data to create change? Well – of course – there’s no simple single thing – but by the end of the day we had perhaps done more to build general skills and knowledge, and conversations between campaigners and open data experts than we had done to identify clear campaign strategies using open data. Open data reduces the costs of finding facts; increases the possibility and practicality of presenting information in dynamic ways; and encourages a culture change that rejects one single presentation of information in favor of interactive interfaces that let people focus on things of interest to them, or in favor of sharing the underlying data and allowing others to remix it. Open data is both a raw material for campaigning; and crowdsourcing, creating and sharing data can be campaign strategies. We’re hoping to follow up the open data campaigning camp with some further meetings and activities – so watch this space for more on exploring the connection of data, campaigning and change.